Can’t readily find a comparison between the three; trying to figure out which to buy for my almost 6-year-old’s birthday. Can you help? Well Leena, hope it’s not too late to choose. Seems like there are lots of different Razor scooter model lines out there. Some have obvious differences, like the Razor Spark scooter, the Razor Powerwing, or the Razor Ultra Pro line. 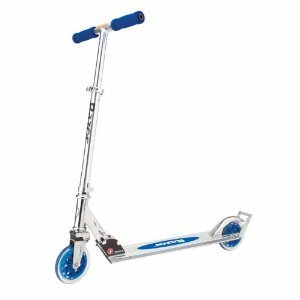 However, the traditional regular Razor scooters seem to come in a variety of flavors, and there doesn’t seem to be a great deal of information about the differences between all the Razor A line of kids scooters. Let’s clear the scooter air “A” little shall we? The Razor A was more or less the original Razor scooter model first offered in 2000. 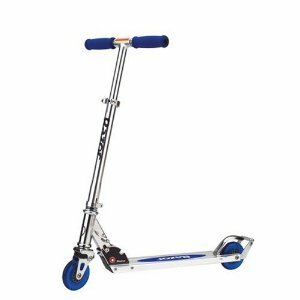 It has the standard Razor foldable design, 98mm sized wheels, is for kids 5 and up and has a maximum allowable weight of 143 pounds. It comes in a variety of colors and the suggested retail price on the Razor A is $39.99. However, you can order them for as low as $29 with free shipping by clicking HERE. Note that you’ll occasionally find a Razor AW scooter out there. That’s the exact same Razor A, but with a wheelie bar on the back. It is apparently a special model sold only at Walmart. The Razor A2 is a slight step up from the A. The basic model and folding scooter design is identical, but the A2 includes a shock absorbing front wheel and a wheelie bar on the back. Most serious scooter riders do NOT like a wheelie bar on their scooter, as it gets in the way during tricks and can easily trip up a serious trick scooter rider. 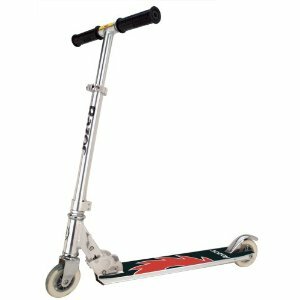 If you see your youngster getting into some serious pro scooter tricks, move on to the Razor Pro. The suggested retail price on the Razor A2 is $49.99, but you can typically find them for around $37 at Amazon by clicking HERE. The Razor A3 is another slight step up from the A2. It’s virtually identical, except that they replaced the wheels larger wheels. Otherwise there is little difference. The specs say it has ABEC-5 “high speed” bearings, while the A and A2 only have ABEC-5s. The larger wheels and better bearings will give your scooter rider a MUCH smoother ride, as well as better control. It does NOT however change the Razor A line weight range, which is still 143 pounds. The Razor Pro Scooter was called the Razor B Scooter for a time, which sounds good from the whole B comes after A perspective, but not so good from the whole “Grade A” perspective. To avoid confusion it was renamed the Razor A4 Scooter, which also confused the heck out of people since it’s fairly different quality than the rest of the Razor A scooter line and the only one with a higher weight range than 143 lbs. Thus the Razor Pro scooter was born. Don’t confuse it with the Razor Ultra Pro either, the regular old Pro folds up like the rest of the A line while the Ultra Pro is fixed. What’s the difference? Take the A, make it of 100% aircraft grade aluminum, add high quality ABEC-5 bearings but keep the 98mm wheels, add thicker scooter grips and throw grip tape the full length of the deck (the part you stand on). The general consensus is the Razor Pro feels better, rides better, and handles better than the rest of the A line while performing scooter tricks. It’s also the ONLY Razor A type scooter for most average sized adults. The suggested retail price of the Razor Pro Scooter is $79, but you can find one for $51 by clicking HERE. But Which Razor Scooter Should I Buy? If cost is a huge issue, buy the Razor A for $29. Otherwise, get the Razor A3 for $44. Don’t bother with the A2. 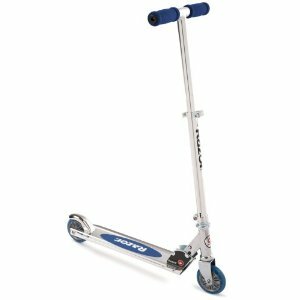 If you are an adult who likes doing scooter tricks, the only choice is the Razor Pro for $51. Thank you! This was very helpful for me. what if youre an adult who doesnt do tricks? is the pro scooter still recommended? is the weight limit of 143 for real? or is it still rideable for a 160 pound person? Weight limits are usually pretty accurate from a manufacturer for a reason. Sure, a 200 lbs person could probably stand on a Razor A scooter and not break it, but over time the wear on the smaller parts like the pins holding the wheels and the pins holding the steering column attached to the deck will break far faster, likely causing you some danger. I certainly wouldn’t risk it. Sorry if I’m a little late here. I am 5’3 and under 130 pounds, will the handlebar for the A1/2/3 be too short for me? You’re pushing it at 5’3 and the Razor A line. That’s about the max before you need to bend over too much. I’d strongly recommend the Razor Pro which has an extra 3″ of handlebars over the A/A2/A3 line. The Razor Ultra Pro has an extra 5″ of handle bar height, but it’s fixed and can’t be adjusted. My 10 year old wants a new Razor after spending an afternoon at a skate park with a well used scooter that was given to him. He tried out some of the other kids’ scooters and most had a smoother ride and he thought the foot area was higher from the ground than his. He said sometimes during tricks his scraps the ground. After doing some research, we thought the A, but I want to be sure as I’m only doing this once. What do you recommend? He is on the smaller side for his age. I’m so glad I found this post. It answered many of my questions. I have one more question, though. I got the A for my kids a little over a year ago and they did great for the first year, but then started having problems. It sounds like the Razor Pro is much more sturdy, but I only see it described for adults. Would it be appropriate for kids too? Will the handle lower enough for them? I have a 5 and a 7 year old and I’m ready to get them new scooters. Thanks for this article… I did understand what the difference between the A2 and A3 was (why do bigger wheels matter) and your discussion was very helpful. What about the a125? Is the size and shape of the pro series about the same as the 125? I can ride the 125 with no hands for as long as I want to, as fast as I want to by holding my hips against the handle bars as I ride. But I need a new scooter and need to decide if I’m just replacing my 125 or if I’d be able to use the pro series in the same way out if it’s size would somehow make no-handed riding uncomfortable. Any help? Hi. I am 5’4″ and thinking of getting the A4. Does the A4 handle bars go up higher than the A/A2/A3? If so what are the measurement differences? Hello. I’m 5’4″. Wondering if the A4 handle bars go up higher than the other models. If so what are the measurement differences? Your website has been VERY informative! I would like to get a green kick scooter for my son that has light up wheels. However, it seems like the Razor S (special edition) is the only green Razor with light up wheels. But the Razor S doesn’t have an adjustable handlebar, which is tricky, because I don’t want to end up with a scooter that my son can’t ride, or can only ride for a short time. He just turned six and is about 42″ tall. Is there a Razor A3 (or one of similar quality and features) that has light up wheels and comes in green? What options are there with adjustable handlebars and light up wheels? Is it possible to buy light up wheels that are green for Razor A3? If so, how much do light up wheels usually cost? Thank you for your help!